When I first graduated from college and both Ben and I were working full-time and living in a cheap apartment (it seemed expensive then), our "fun money" was a hefty portion of our incomes. I used to go to the mall on a bi-monthly basis and drop a fair amount of money on clothes. My wardrobe was in constant, seasonal rotation. Ben used to spend his on "fun groceries" and expensive beer-making supplies. When we moved to PDX and shifted from dual incomes to just my income and Ben's student loans, priorities shifted massively but our habits didn't take their turn in shifting quite as quickly. Our rent now takes up a far larger portion of our budgets, our cash-flow is significantly decreased, and we still have the same tastes. What to do but the dreaded budgeting process? The dreaded budgeting process axed my entire clothes budget in favor of actually providing some money to make our wedding happen. I can't say I am resentful, as I can sacrifice a year of clothes for better flowers at my wedding and prettier save-the-dates, but it has been tough to avoid shopping even when the seasons are starting to transition. I've definitely also had my eye on ways to earn extra money, gift cards, giveaways, and use sales to my advantage. I try to maximize my regular boring spending (cell phone bill, utilities, groceries, high wedding bills) on my rewards credit card (that I then immediately pay off) so that I end up with some fun money at the end of the month entirely in "cash back." With my clothing budget then limited to the items I can snag with rewards, I am definitely not hanging around the full-priced section of the store but waiting for awesome coupons, weekend sales, or big markdowns. When Ross contacted me about their Fall blogger promotion and asked me to shop for Fall at their stores, it was the perfect opportunity to a) change my mind about discount and bargain hunting (I am not above it, contrary to what I may have thought) and b) snag some pieces that would carry me through Fall without additional expenses. 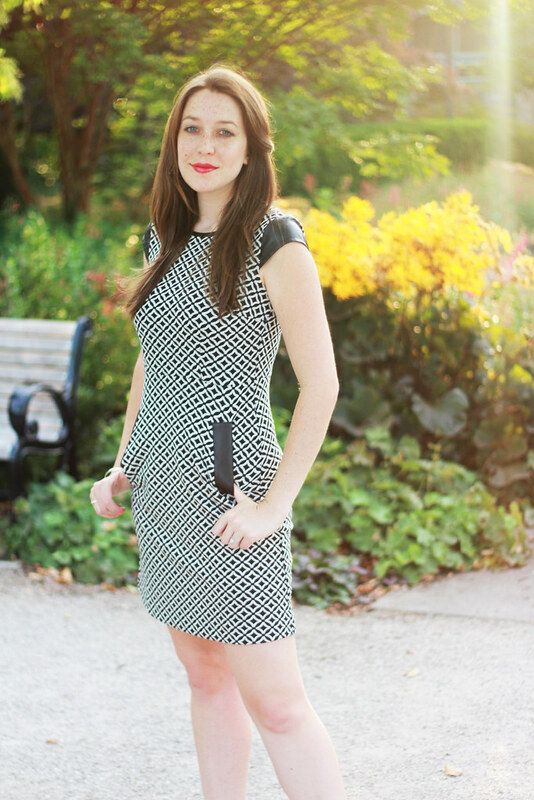 This dress reigned supreme on their racks as a perfect dress for work and entertaining. Graphic black and whites are always in season and can be paired with black, white, opaque, grey, or colored tights for a great fall look. Dresses can be rocked indoors for a party with simple heels, or taken out to work with tights, a leather jacket, and boots. 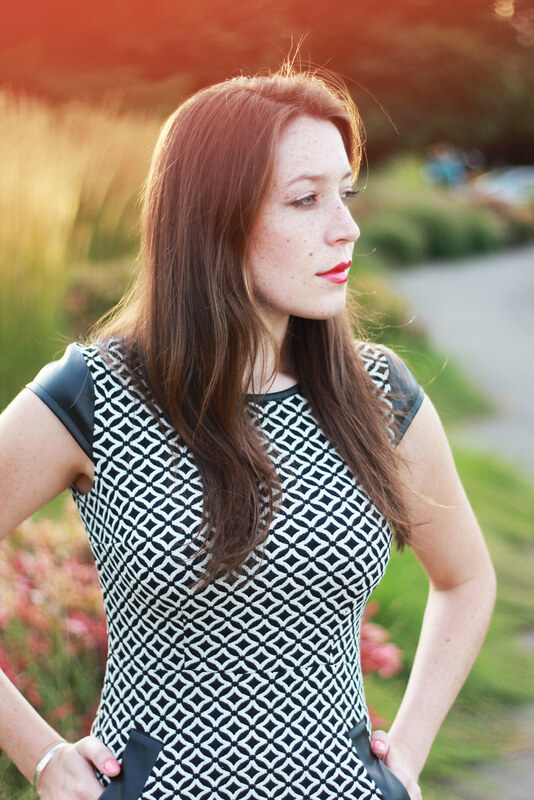 I was pleasantly surprised to find such a high quality, on-trend dress to supplement my Fall closet. I'm also participating in Ross' Fall Fashion blogger contest and you can see my look, and the look of some other stylish ladies, on their Facebook page today! Give your favorite look a vote! 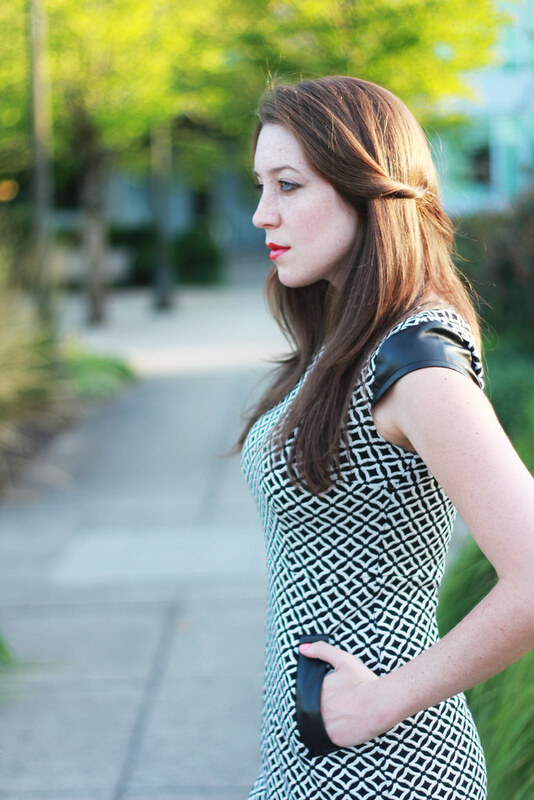 LOVE the leather detailing on this dress (and those shoes). Perfect! And pretty flowers! You look beautiful and stylish in this dress! You're right, it's perfect for work but also for a night out. Love that dress! Even though there is a lot going on with the print it's still clean and simple. Oh that dress is stunning! This dress is perfect on you. I love it. And the new layout! I really love this dress on you!! Loved how you paired it with some flats instead of the usual heels!! i like your outfit but i LOVE your hair! Click here for a similar blog! What a great dress. I love the flats too. This dress is absolutely stunning. Love the dress! I am a big fan of the little accents of leather in the pockets and sleeves... it gives an edgy twist to the elegant dress!